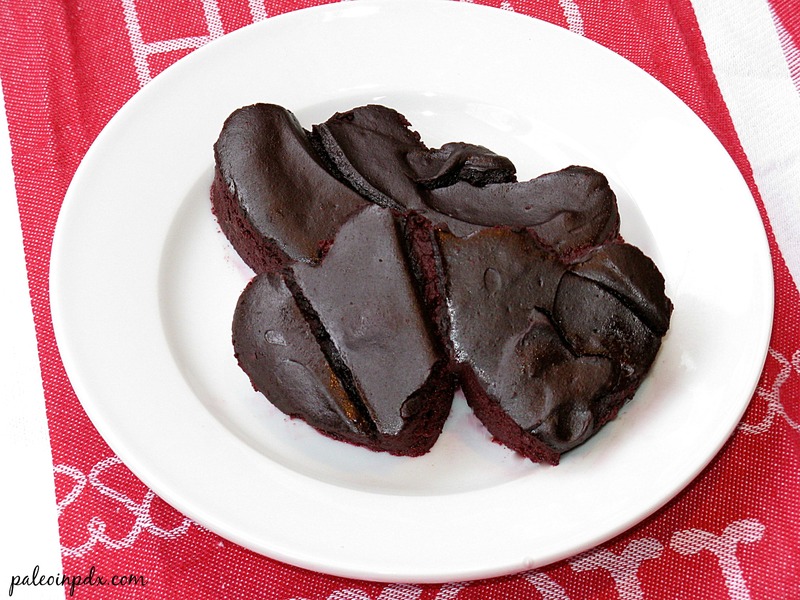 These spicy red velvet brownies make for a unique Valentine’s Day dessert (or for anytime!). This was my first time making a dessert with beets and I must say, it worked out very well. There’s still a little bit of beet flavor, but the honey tones it down and the cocoa makes for a nice complement. Additionally, these are incredibly moist. That would actually be how I’d describe the brownies if I could only pick one word. Maybe red (or reddish) too, if I could pick two words. I’m actually not a big Valentine’s person, but I still always end up doing a little something for Jesse. I think it’s because I was raised celebrating Valentine’s Day, both in school and at home, and a part of me still enjoys doing something cheesy or cute. What can I say? I don’t go all out though and always keep it low key. We usually have dinner at home with a special dessert (these brownies this year! ), and I like to surprise Jesse with a few special dark chocolates from a local chocolatier. Inspired by Elana’s Pantry Purple Velvet Torte. Biggest beet ever. 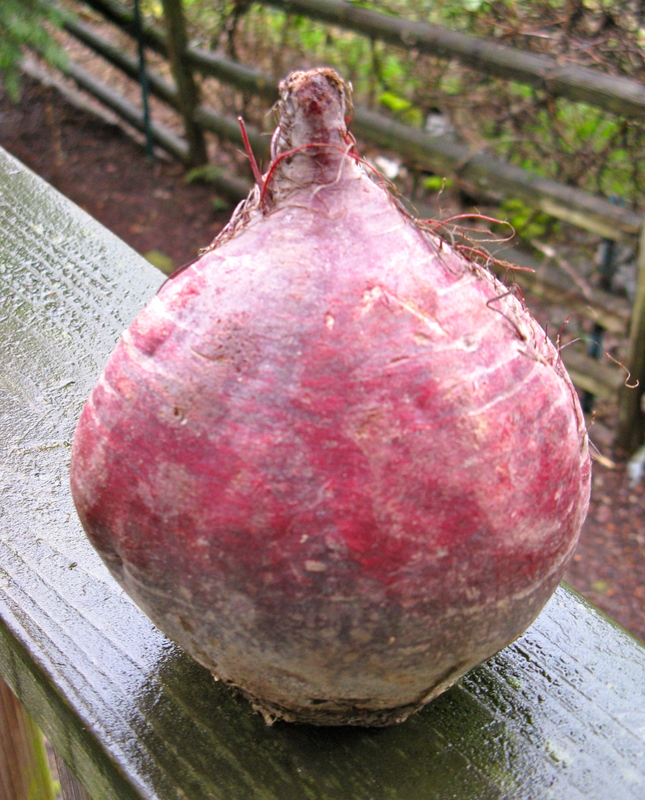 I only needed this big beet for the recipe because it yielded so much. Place beets inside a steamer basket in a pot, and cook for 15-20 minutes or until fork tender. Once done, add the beets to a high-speed blender with the vanilla and honey. Blend a couple minutes, or until smooth and well combined. Add the cinnamon, cayenne, sea salt, cocoa powder and homemade chocolate chips. Blend on high for a minute or so. Then, add the melted butter and blend again. If the beet mixture is still warm, which it most likely will be, temper the beaten eggs by mixing a little of the beet mixture into the eggs. Once mixed, pour the eggs into the blender. This will ensure you don’t end up with scrambled eggs in your brownies! Blend for another minute, or until mixed through. Grease an 8×8 pan and pour batter evenly into pan. Bake at 350 degrees for 45-55 minutes or until a toothpick inserted in the middle comes out clean (it’ll still be beet red though!). Let cool for at least 25 minutes before cutting, as it takes some time for the brownies to set up. If you cut into them too early, they will fall apart. 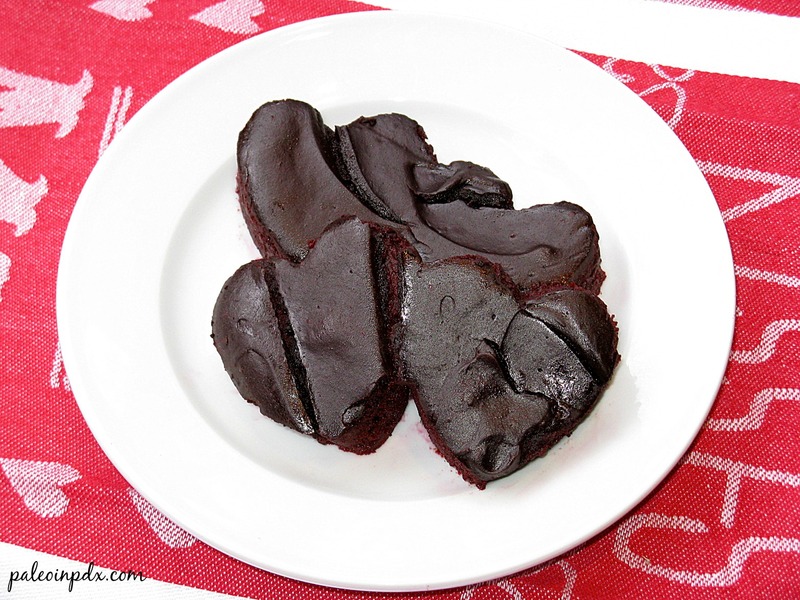 Once cool, cut into squares or use cookie cutters to make shapes. I made heart shapes for Valentine’s Day. Yum. I love beets, but have never used them like this! Yes, sounds like you needed more beets if you were going for the reddish color. These brownies are noticeably red, both before and after baking (kinda hard to tell in the photos though). Tried these last night. Wasn’t sure how well the beets would work out. I’d never baked with them before. In the past, my kids didn’t care too much for them (they had a bad experience with them at their great-grandmas, thinking they were cranberries) But I wanted to try a red velvet type recipe without actually having to use red food coloring. Yuk! I thought I’d rather have a beety taste than the bitter taste of dye. Well, it got great reviews from my kids! Yeah! Thanks again! We were just talking about all of the things you can sub into brownies. I mentioned beats and I think that is the only way I would eat beats! ha ha! If you’re not a beet fan, which I’m guessing is what you were hinting at, you may not care for the flavor. They’re definitely earthy. It’s toned down by the honey and cocoa, but is still very much apparent. I hope you like it if you try it though! Do you like roasted beets? That’s one of my favorite ways to eat beets. Beet chips are pretty awesome too. Beets are not beats though, as far as I know…unless you know something I don’t 😉 Sorry, I couldn’t resist! No problem! I deserve it! I need to re explore roasted beets! Hehe! I like to roast beets with coconut oil, sea salt, pepper and another veggie, like carrots or brussel sprouts. So good!